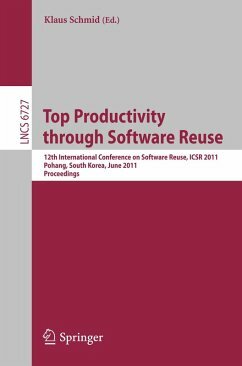 This book constitutes the refereed proceedings of the 12th International Conference on Software Reuse, ICSR 2011, held in Pohang, South Korea, in June 2011. The 16 revised full papers were carefully reviewed and selected from 43 submissions. They are presented together with one keynote, three workshop papers, a doctoral symposium report and two tutorials. Topics of interest are domain analysis and modeling; asset search and retrieval; architecture-centric approaches to reuse; component-based reuse; COTS-based development; generator-based techniques; domain-specific languages; testing in the context of software reuse; aspect-oriented techniques; model-driven development; reuse of non-code artifacts; reengineering for reuse; software product line techniques; quality-aspects of reuse; economic models of reuse; benefit and risk analysis, scoping; legal and managerial aspects of reuse; transition to software reuse; industrial experience with reuse; light-weight approaches; software evolution and reuse.